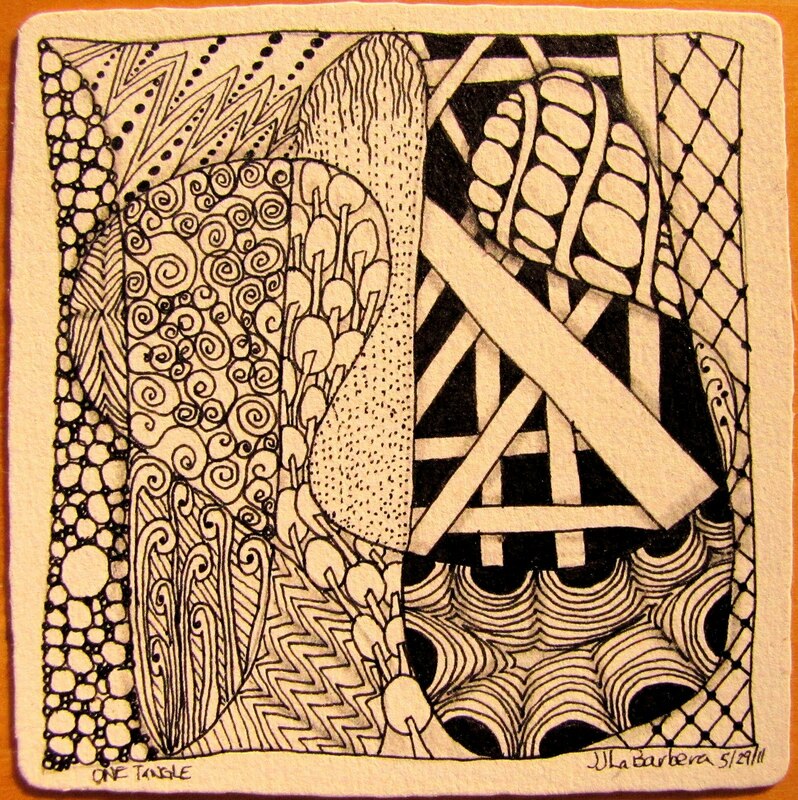 Tinker Tangles: My Zentangle Kit has Arrived! 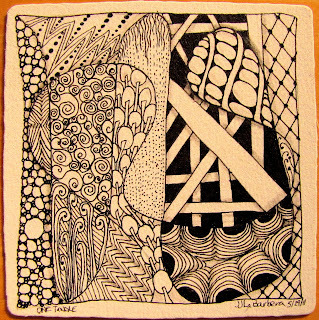 I finally got around to ordering my official zentangle kit. I had put it off for no real good reason but then I sold one of my pieces and thought I'd celebrate with a kit. I ordered it on Monday or Tuesday and it arrived by Friday. Sweet! Just in time for the long weekend. 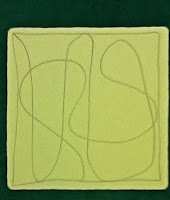 Last night I sat down to really explore the kit and try out what it is like to draw on an "official" tile. I have been using watercolor paper that I cut into 3.5" squares. I looked through the booklet that came with it first. There I found some direction on how to make a few tangles that I have not yet tried out. The most helpful thing for me though was the section on making strings. I have always been a little careful in making my strings. Thinking that they should be simple, I was afraid to make the string too busy. The examples in the booklet however, showed me that I could be freer with my string. Armed with this new courage, I drew out my string. I tried to copy one of the examples in the book but my drawing got a little off track. No matter, I just went with it. Next, I got out the die and rolled to see what my first tangle would be. I must admit that I had never thought of leaving pattern choice to chance. I always study and think about what pattern I want to go where. Sometimes, I want to try out a new pattern and that make choosing patterns easy but I find that I can sit there for a while pouring over my books and websites looking for a tangle that I think might look good next to those I've already drawn. Rolling the die helped to make quick work of what to draw next. I think that I will need to make a few legends with different tangles for future use. Then, I was off. I sat and drew with Dr. Who on in the background to keep me company. Sometimes I listen to music but I'm a new Dr. Who fan and there was a marathon on the T.V. and well, you know how it is. I did have to pause and watch the video on how to draw Purk. The steps aren't laid out in the booklet and I wanted to make sure that I knew what I was supposed to be doing. I think I may have found a new favorite. I have seen it in other's work but was unsure on how to draw it. Purk is quite a lovely tangle and I think it looks really great. So, here is my final result. I like it. There are a few bits that aren't great but there are a few that really work. As usual, there will be some things that I take away from this tangle and use in a new piece later on. I got to use some tangles that I haven't used before, and some that I have used a lot. The "busy" string gave me more movement through the space. Movement that hasn't usually been in my tiles before. Not a lot, but some. Take the pokeroot for example, that flows up through the space to me. I haven't really thought about movement in my tiles before but you can bet that I will in my next one.